Cloud computing for businesses has become the new standard. IDC expects that by 2020, more than 60% of all IT spending will go towards cloud-based services. It’s evident then that cloud-based services are here to stay. If your business isn’t there yet, or hasn’t explored cloud computing yet, we got you covered. When we refer to the cloud, we’re talking about a centralized location on the Internet that can store data. This makes that data accessible anytime from any device. The benefits of embracing cloud-based services are endless. Below, you’ll find just a few. Using the Cloud makes saving and accessing files easy, even for the most non-tech savvy business owner. Additionally, the Cloud allows you to take your business on the road with your mobile device. This gives you close access to your business at all times. In house, your staff will have no issues sharing data between one another. Most applications that use the Cloud auto update themselves. Your IT supplier will take care of any updates for you, so you don’t have to worry about maintaining the system yourself. This gives you the opportunity to spend more time towards the things that matter. With your data in the Cloud, regardless of what happens to your machine, you’ll always have access. If systems fail, you don’t have to worry about losing everything. This is because data backup on the Cloud is easy. You can even remote wipe data from lost laptops to prevent your information from getting into the wrong hands. 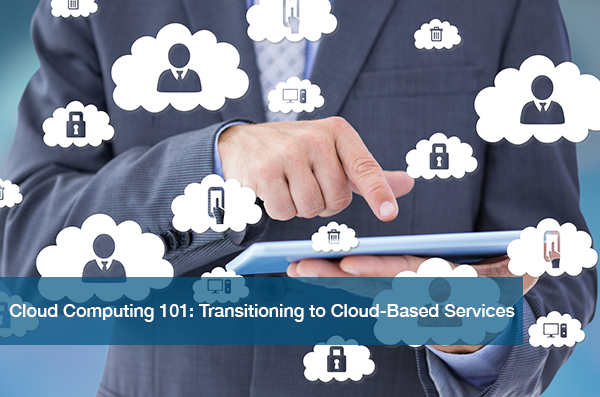 So you’re now ready to make the change to cloud-based services. What can you do to ensure a smooth transition? Transitioning to the Cloud will affect the way your team operates, so you’ll need to be sure they’re prepped on what’s to come. Also, communicate why you’re choosing to move to cloud-based services. Detail what the benefits will be for everyone. Offer trainings so that your team feels even more comfortable. Be sure to do your homework on the Cloud. Understand how it will operate within your business now. Also, take inventory on your current infrastructure to see what needs replacing and what needs phasing out. Work out the kinks now so that after the transition, you’re well prepared for any performance issues that may come up. It’s important that you find the perfect IT provider for your business. You want someone who will manage your move every step of the way, and provide feedback that will help your business succeed. ITC can help you with your cloud-based services. We offer a free IT needs assessment to learn about your business and assist with a cloud solution unique to you. Contact us today at (512) 348-8324 to take your business into the cloud.